There are now 343,000 international students enrolled in French higher education, representing a 4.5% increase from 2016/17 to 2017/18, and a second straight year of stronger growth for France’s international enrolment. News of the latest increase in foreign student numbers dovetails with the French government’s announcement of a new international education strategy last fall, one that established a target to host 500,000 international students by 2027. Achieving this goal relies on France welcoming an average of 5% more foreign students per year through 2027. The new strategy, entitled Bienvenue en France, is now backed by a newly announced €10 million (US$11.4 million) support fund from the French government aimed at improving international student services across French universities. Among other goals, the fund is intended to further expand English-taught programmes (ETPs) at French universities. This is an increasingly popular category of programming across Europe due to the ability of ETPs to boost the attractiveness of a study destination for students in a wider field of sending markets. The number of English-medium degrees in France has grown considerably over the last 15 years, from 286 in 2004 to 1,328 as of fall 2018. Of those, 1,015 are currently taught entirely in English, with most of those programmes offered at the master’s level. At the same time, the fund will also support the development or expansion of French as a foreign language courses for foreign students. The Ministry of Higher Education, Research and Innovation has set aside €5 million of the fund for proposals from French institutions seeking funding for ETP and French language programmes, and also for new initiatives to provide support and integration services for visiting students. The funding round will close on 2 May 2019 and is open only to institutions that are participating in the Bienvenue en France branding programme. 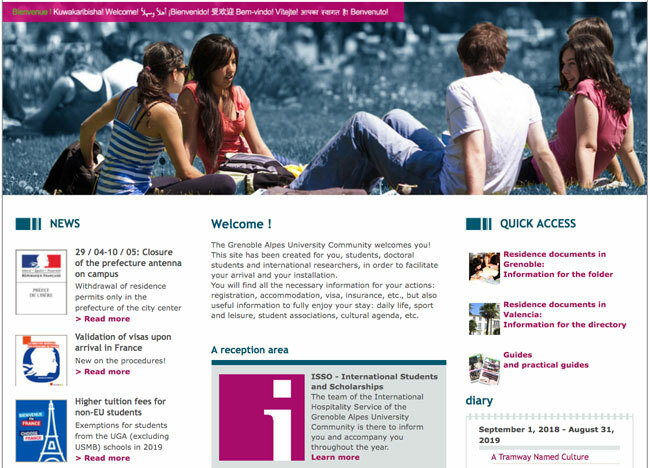 Already, French universities are adapting their websites to reflect the Bienvenue en France brand and objectives, such as we see in the example below from the Université Grenoble Alpes. Last year’s enrolment growth is helping France to hold its position in the top seven study destinations worldwide, and outpaces the most recent year-over-year gains recorded in the United Kingdom and the US. Still, the extent of the increase is low compared to the growth experienced by competitor countries, including Canada (16.3% in 2018), Australia (11.4% in 2018), and Japan (12% growth in 2018). 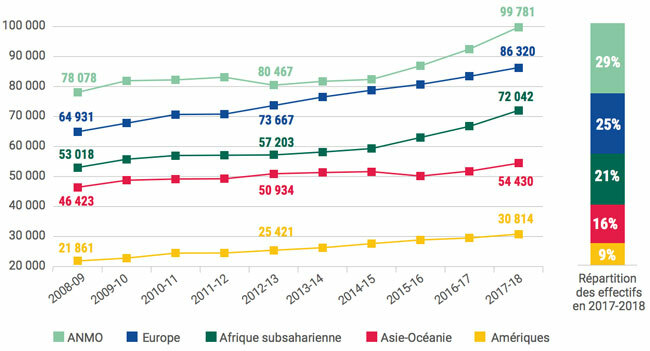 Nearly half (46%) of France’s international student population is composed of African students, while 19% come from other European Union countries. As of 2017/18, the top five source markets are Morocco (39,855), Algeria (30,520), China (30,070), Italy (13,340), and Tunisia (12,840). The French government notes that the international student population is becoming more diverse, with notable increases from Italy (up 58% since 2012), Portugal (up 51% since 2012), the US (up 33% since 2012), and India (up 90% since 2012). France is also ever-more on the radar of Brazilian and Colombian students, with the former growing by 10% and the latter by 29% since 2012. However, two other key source countries, China and Vietnam, are not growing, with declines of -1% and -11%, respectively. The following graph shows how flows of students to France from various global regions have changed since 2008. Please note that the reference to “ANMO” in the legend refers to l’Afrique du Nord et le Moyen-Orient (Middle East and North Africa region). Surveys conducted among international students in France showed that half (51%) considered the complexity of administrative procedures in France, notably around student visas, to be “significant challenges.” The French government is accordingly moving to improve student visa processes in line with the Bienvenue en France strategy. French embassies and consulates abroad now give priority in visa processing to students wanting to come to France to study, and there is a new France-Visas portal that expands online services for visa applicants. The government also promises that students will now find it easier to renew student visas and secure long-term visas for the duration of their studies. Bienvenue en France also includes a plan to encourage international students with advanced degrees who have left the country to come back to live and work. As of this March, students holding master’s-level-degrees obtained in France can receive a residence permit allowing them to return to France to launch their own business or look for employment. This follows on from post-graduate work policies that have played an important role in boosting the attractiveness of other global study destination, notably Canada, Australia, and Japan. This entry was posted in Europe, France, Higher Education, Regions and tagged .